Home > Labels,Tags & Nameplates > Metal & Plastic Tags > Brass Tags > Brass connectors. Items per quantity: Pack of 100 connectors. 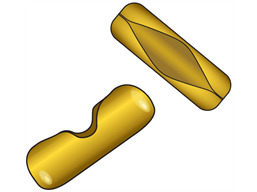 Brass connectors. For use with brass beaded ballchain. Supplied in packs of 100 end connectors. Valve tag fixing products. Brss connectors. Supplied in packs of 100. To be used with brass ballchain, code LBB1. CBB1 Size to fit 3.2mm ballchain.